Here is something I am trying with my students to increase their ability to identify what they are working on, increase staff awareness and informally communicate with parents. At the end of each session, each student picks out a sticker. 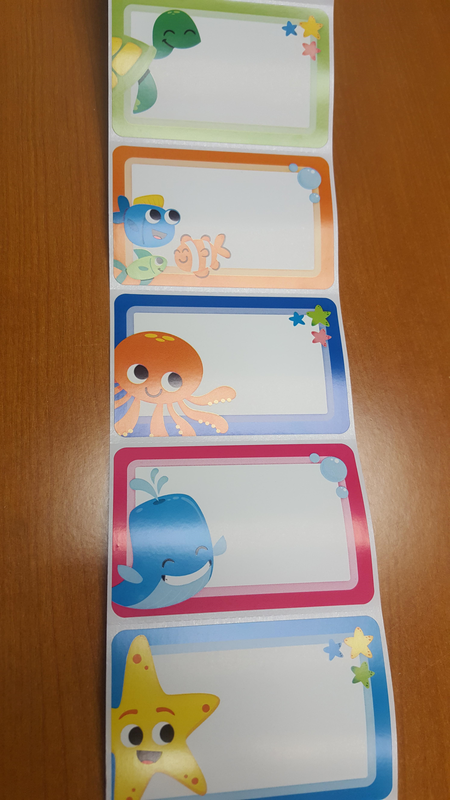 They are self-adhesive “name tags.” My door and room are currently decorated in an under the sea theme and so the stickers coordinate. I also have plain ones on stand-by for when I run out. They help me draft a VERY simple sentence about what they worked on. 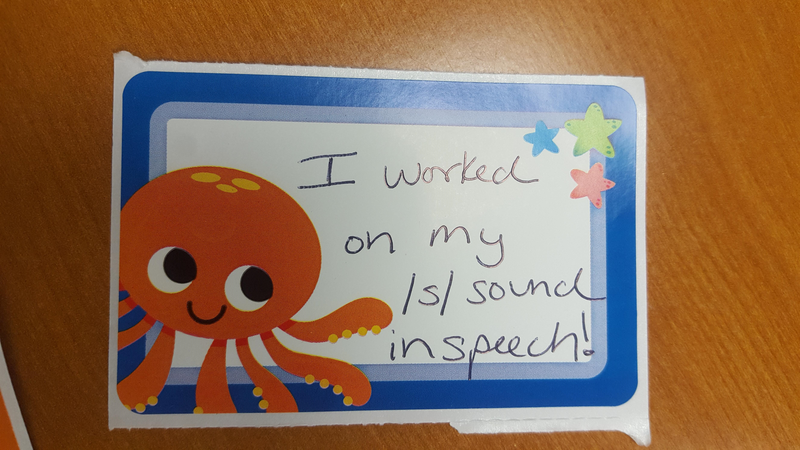 Examples: I worked on action words in speech. I worked on my /s/ sound. I worked on answering questions in speech. The teachers and assistants can then ask them about what they did in speech. And the answer is not “played games”. Eventually, I will write messages that encourage carryover practice on them such as, “Ask me to say “go” with a correct “g” sound” or “Ask me “where are we going?” whenever we change locations. My teachers love being able to ask the students about speech during down times (waiting in line, waiting for peers to finish their activity). If the sticker makes it home, the parents have given me good feedback too. This doesn’t take much time and is a natural ending to our sessions. Hey all! We will be emailing this out as well, but HERE is the official nomination form for JCPS SLP of the Year! Please take a few minutes to nominate a colleague who is doing exceptional work! The nomination is due on November 20, 2017 and the winner will be announced at our annual December 1st meeting! This chapter is focused on Katherine’s relationship with Jeremy, himself a stutterer. They had met in Chicago while she was there interviewing people for her book. He was an alumnus of a regimented speech therapy program and she was an open stutterer. She found herself drawn to him, but after attaining his phone number, she never got up the courage to call him. Two months later, he called her and asked if she would like to interview him in Chicago. She spent a week with him in Chicago, and in between interviews with other stuttering people, she spent time with him. She felt such a strong bond growing between them that she invited him to go on a cross country journey with her as she completed some interviews for the book. He agreed, and their relationship took off. I found it interesting that Katherine had met only one other stuttering couple. I would have thought that more people who stutter would have found solace in being with another who understood their struggles. However, as Katherine said, being with Jeremy was like coming face to face with her stutter every day. She not only felt the tension and exhaustion caused by her own stutters, but also felt them when Jeremy stuttered, as well. Katherine questioned Jeremy if her stutter made him feel uncomfortable, as she chose to stutter openly, and he followed a speech program. He said that, yes, at first he was caught off guard that someone so beautiful with so much going for her would choose to openly stutter, but that now, he sees that it is just who she is. Katherine herself begins to fall in love with Jeremy, and she realizes that if she can love someone who stutters so completely, then surely she can do the same for herself. Ah! I knew it would be mentioned- the SpeechEasy device brought to the market by the Janus Development Group in 2001 which was advertised as a miracle fix for stutterers. Katherine knew the principle behind it: No one stutters when they speak in unison. She talks about remembering the leaflets set around her home growing up. She looked at them, but they were just another reminder to her that she was failing. She knew about delayed auditory feedback and re-creating the choral effect in her brain, and also knew these little hearing aid looking devices could cost between $4-5,000! But, she trusted Dr. Loucks and learned “What we see as stuttering is really a reaction; it is what our bodies are doing in response to something internal.” Dr. Loucks continues to talk about stuttering being different then all the other speech disorders because it “seems to arise after people have already formed what they intend to say. The brain knows what it wants to say, but can’t carry it through.” Katherine liked his theory and looking at her stuttering as more of a motor glitch which made it somehow less frightening and less of a personal failing on her part. She was impressed but not convinced this would be the “miracle cure” she was looking for. Will the effect wear off soon? Good question! Dr. Loucks also but on the earpiece which first annoyed Katherine. I mean, we know HE is fluent…whaterver! Then she hears his voice start to block as he says his name. He takes off the earpiece and warmly tells her, “You see, Katherine we all walk on a tightrope.” (musical interlude…hence the title of Chapter 8). She says that she can see that all of us are standing together as we teeter on the edge of fluency and dysfluency. We all have individual variations. Some have a wide beam to walk on when circumstances are altered (DAF), and some of us “wobble more” (not the dance I assume). She now takes us back to the Boston area in October 2008 where she planned to get to her family’s house on Cape Cod to plan the next year of her life. She said her dad referred to it as “Our place of Magic.” Now both of her parents were living there also. She started reaching out to researchers and experts in the field, but was too afraid to contact other stutterers quite yet. She wanted to know what CAUSED 1% of the world to stutter and was on a mission to meet stutterers who were role models- smart, brave, and courageous. She wanted to find the TRUTH behind stuttering. So, she gave herself 10 months to travel across the US and do more than 100 interviews and planned for her research to end with the National Stuttering Association’s (NSA) annual conference in July. She talk about missing England and her friends, but that her journey was worth it. She also talked about the history of stuttering and treatment, anywhere from primitive hieroglyphs, to Moses in the Bible, and Dr. Freud. The treatments had ranged from using an iron to sear lips, cutting holes in one’s skull, electric shock treatment, and a “magic fork”! ( I thought about the Little Mermaid movie). During more modern research attempts, she came to the idea that stuttering is an enigmatic condition with multiple causes. production. He also talked about the excessive amounts of dopamine in people who stutter, its similarities to Tourette’s Syndrome treatment, and medicines that were dopamine antagonists. Note: There is no FDA approved drug for stuttering. She then talked to Dr. Drayna and about the role hereditary plays and stuttering being a possible hereditary condition. She was relieved to learn stuttering was not anyone’s fault. She also discussed her thoughts about possibly having children in her future that stutter. Would they go through the same pain and embarrassment as she has? Would they blame her? She also went outside traditional speech therapies and meds and talked about treatments such as vitamins and hypnosis. She learned from a journalist in North Carolina that was gay and compared the two and feelings of struggle for acceptance (homosexuality and stuttering). “We don’t need to be changed. We need a change in attitude rather than a change in our speech.” This brought up two ideas for her: voluntary stuttering and self-advertising oneself as someone who stutters from the therapy world. She brought up Joseph Sheehan’s (SLP) approach of acceptance, education, and tolerance of dysfluent speech. Although some people would introduce themselves as a person who stutters, or yell it on the subway, or even wear a t-shirt, she preferred the voluntary stuttering to gain control of her speech and lessen the fear of stuttering. She talks about going to Starbuck’s and stuttering on purpose. Although it was uncomfortable, she was determined to do it, even when a cashier tried to offer her a piece of paper and pen to make it “easier” for her. Katherine’s attitude was changing. It was more of a game now in which she had control of her voice therefore becoming free of the fear. She didn’t find a cure, but a sense of peace and control instead of her previous feelings of failure. 1. Have you ever worked with a person who stutters who has used a device such as the SpeechEasy? Did it work? 2. Have you ever had a feeling of guilt or worry about something you may pass on to your children or future children? This is true with many genetic conditions or ones thought to be connected to heredity. 3. Do you use voluntary stuttering as a therapy technique with your students? I personally find it a confusing concept for younger kids that I see at the elementary level now. The thought of stuttering more to stutter less is confusing. I think the idea of sometimes stuttering on purpose and being open and honest about your dysfluncy does seem to lessen the fear and anxiety that you MAY stutter. Marie Fisher shared a newsletter that she sends out to families of children who use AAC devices. This is something that she does monthly and thought you all might find useful as well! 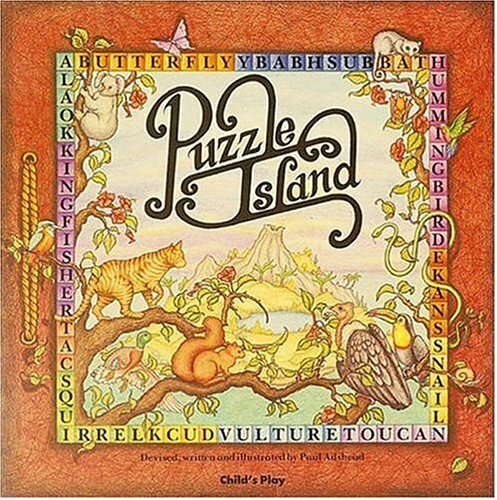 Look up photos of islands on the google, a paper map, an atlas or the google maps. Have you found the units that we worked on during the back to school meeting useful? What benefits have you seen (for you and your kiddos)? Wow! Part One. My assignment for our book study is to provide a recap for part one and the only thing I can think to say to start this off is, “Wow!” I am really enjoying this book. In reading the summaries and comments on the blog, it seems like Katherine is taking not just me but all of us on an emotional journey as she shares her life with stuttering. *Side note: I almost wrote “as she shares her life about stuttering” but I prefer the way “with stuttering” reads, as if stuttering has been the familiar yet annoying constant travel companion riding with her on this adventure of life. Katherine often personifies stuttering during these first seven chapters, referring to it as a “demon”, an “opponent” in battle, “lurking deep within”, so I think making a life-like comparison like this works. For those who participated in our book study for Schuyler’s Monster last fall, does this remind you of anything? I think personification is a good technique for authors of these memoirs to use in an attempt to convey to readers just how much of a struggle these communication impairments are for the people directly impacted by them. For us, the impairments of our students can be a struggle when we are working with them in therapy, when we’re writing their paperwork, and maybe off and on as we go about our normal routines and a random thought about how to best help them creeps up, but we do not carry those burdens of their disability constantly like they might. So, yes, an emotional journey over here for me. Cliché but I have been on the edge of my seat to see how Katherine progresses with her stutter! I look forward to watching the video of Katherine that was shared in a blog post a few chapters back but am trying to hold off until I finish the book, as I’m enjoying the way the author writes and like the suspense I feel as she goes from elementary-age to now her twenties as she shares her story. What has stood out to you the most in part one? For me, I think two things stand out. On page 42 (I’m reading via Kindle) Katherine writes that therapy implies being abnormal and needing help. As someone who majored in psychology in college, I relate to this thought when it comes to discussions around therapy and especially mental health stigma. Our “official” job title is speech-language pathologist but we are often referred to as speech therapists. When I refer to myself as a speech therapist, I’ve had multiple students make funny faces and say something like, “Therapy? I don’t need therapy.” Before I used that word they seemed fine with coming to speech. I’ve learned that many students equate therapy to counseling for a mental health impairment and while this has opened up the door for great discussion in the speech room, I sometimes prefer to refer to myself as a speech teacher when talking to my younger students or when talking to my students around peers who are not in speech, as many times I feel this can be easier, especially in the school setting. I know some SLPs feel strongly about the phrase “speech teacher” but I never have. With that said, I wonder if I should. Should I always refer to myself as a speech therapist since it does provide such a great opportunity to talk about the word therapy and to open minds that were possibly closed? Referring to myself as a speech teacher may be easier for me but saying speech therapist (or even speech-language pathologist) would likely be more beneficial. That’s a wrap! This has turned out to be less of a full, formal recap than I intended but I hope it works. I’m really curious to see how part two is written, especially since Katherine included quotes from the people she met in America throughout part one. Another good book choice, Kinsey!